The V13 is designed to be safe and robust, whilst incorporating a high level of future proof technology. Construction is from stainless steel, and built around standard non-proprietary PC technology, securely mounted in the door for ease of maintenance. 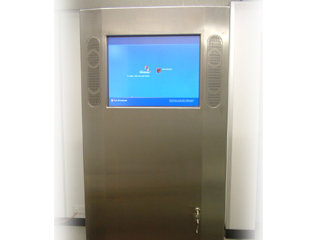 This stunning stainless steel cabinet provides great functional flexibility, which enables the units to be used for a wide range of applications that require storage and kiosk functionality in one. Especially suitable where high traffic durability is a requirement. The Kiosk can house a video camera for conferencing or monitoring purposes and for unattended or external use a bullet proof TFT screen can be fitted. Dimensions: 500x1800x500 (WxHxD).